Many Americans prefer landscaping that makes their lawns extra beautiful and increases property value. However, despite regular maintenance and care, it’s hard to achieve the perfect landscape, owing mostly to the fact that plants are prone to diseases and vulnerable to extreme weather conditions. Real grass, for instance, gets easily destroyed after being subjected to heavy footfall from pets, wild animals, and active children. If you’re after a lawn that can look at its best year round, consider installing artificial grass instead. Not only can you attain a lush lawn, but you can do so without constantly worrying about its maintenance. Indeed, artificial grass can address the three most common landscaping problems that continue to pester homeowners. Landscapes tend to have soil problems due to too much water, nutritional imbalance, and erosion. High levels of standing water from poor drainage, for instance, can lead to reduced organic matter that supports microbes and subsequently results in unhealthy grass and plants. Furthermore, plants can get sick or die from nutritional imbalance if they don’t receive sufficient fertilizers. In addition, landscape soil lose important nutrients because of heavy rains that produce erosion. On the other hand, artificial grass doesn’t need soil, thereby doing away with any of these soil problems. Additionally, modern artificial turfs have drainage systems that prevent lawn flooding and runoffs. Insects can also infest lawns and kill plants. Grubs and many types of bugs are common pests that produce extensive lawn damage without proper pesticide treatment. They love soil and can quickly multiply in plants and underneath the ground. Artificial turf, being made of synthetic plastic, repels pests on their own. While insects can affect other natural plants, an artificial turf may reduce their population due to the absence of fertile and damp lawn soil. As a whole, landscapes can develop diseases due to pests and extreme weather changes. Pests can contribute to diseases that deteriorates or kills grass, while storms and harsh winters can definitely affect landscape health. Artificial grass, however, stays green despite heavy rains and storms. 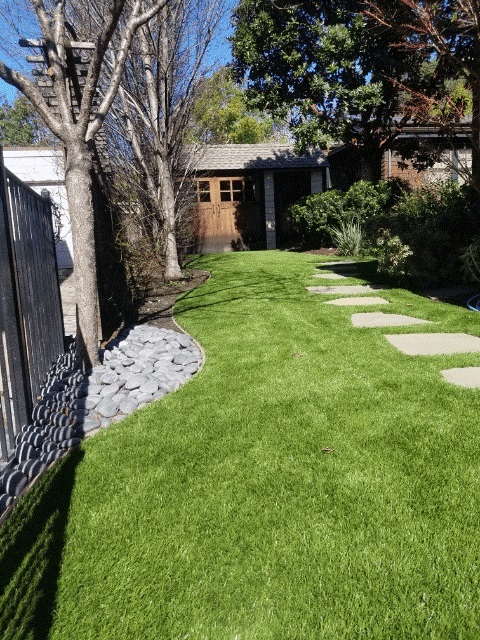 Resistant even to the toughest of hot spells, high-quality artificial grass remains verdant while the rest of the neighborhood with natural grass would have lots of brown patches. Landscape problems cannot be entirely eliminated with the presence of soil, insects, and harsh weather. However, installing artificial grass may reduce many of these problems for it does not have soil and is unattractive to insects. If you experience any of these garden problems, consider replacing your natural turf with artificial grass to have a healthier landscape.